Alfred Hitchcock’s 1936 film is one of the master of suspense’s earlier efforts, but it once again shows why he’s one of cinema’s greatest directors. Based on Joseph Conrad’s The Secret Agent Sabotage follows a cinema owner turned bomber (Oskar Homolka) planning a terrorist attack on London, while Scotland Yard desperately attempt to unravel the plot. Sabotage holds up ridiculously well in the 21st Century. The central themes on terrorism within the British capital are even more relevant today in 2015 than they were when Hitchcock first made the film in the 1930s. That’s what makes the movie such essential viewing today – the concept of terrorism hitting at the heart of the homeland. Running at a brisk 76 minutes Sabotage is one of Hitchcock’s earlier efforts and the film was one of the last films that the director made before upping sticks and moving to Hollywood. It’s easy to see why America came calling because Sabotage is yet another fine example of the director drawing tension from a relatively simple concept. The fact that the central character owns a cinema lets Hitchcock play with his passion and unleash tiny homages to the art form that he clearly loves so well. Homolka delivers a strong performance as the terrorist, while (future Tim Burton favourite) Sylvia Sydney offers strong support as the wife oblivious to her husband’s deadly secret. You’re drawn into the characters here and you invest in them as well as the plot. That’s what makes Hitchcock such a great director – he litters his film with tiny details. He’s not content with simply ratcheting up the tension – he works at making the world in his films feel tangible and real and this helps draw the audience in when things become emotionally taut. They’re onboard with him when the plot gets farfetched and at this point they don’t care when he takes them over the edge and into the ridiculous. 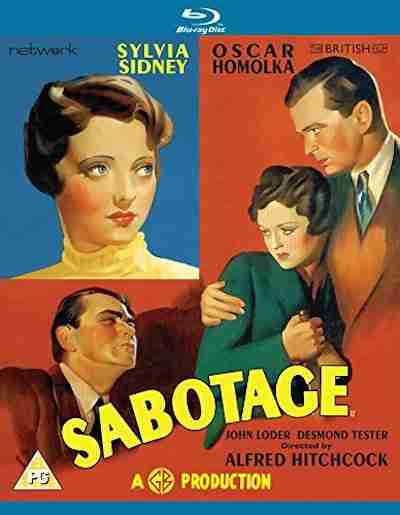 Every Alfred Hitchcock is worth watching but Sabotage is a great example of his work as a director without the excess of a Hollywood budget (not that it was ever a bad thing). It’s a tense, dramatic thriller that works as well today as it did back when it was released in 1936.